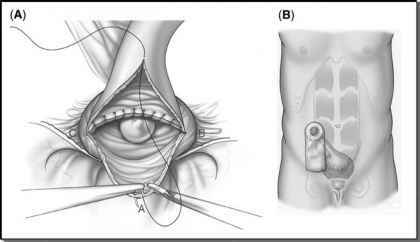 FIGURE 9 ■ Laparoscopic ileovesi-costomy formation: Anastomosis of the spatulated end of the proximal ileal loop end to the cystotomy site with intracoporeal suturing (A); maturation of the stoma to the laparoscopic port site (B). Source: Courtesy of the Cleveland Clinic Foundation. appears to be promising. Further clinical experience and long-term follow-up will be necessary to confirm our findings and define the role of the laparascopic approach for this technique of bladder augmentation and urinary diversion.